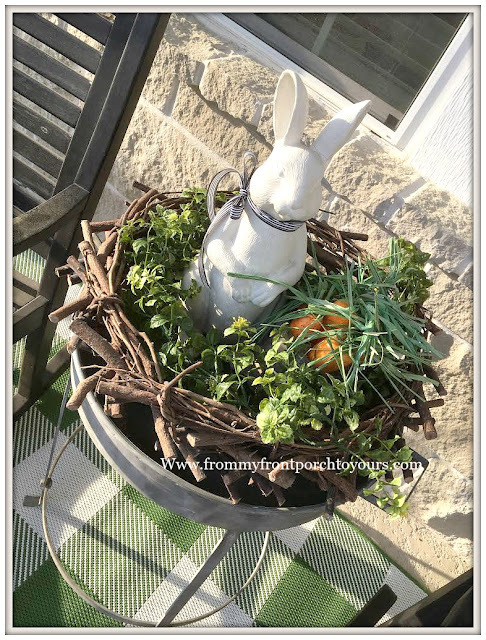 I had fun creating our early Spring front porch. Items are a mixture of new and old. The carrot garland is from Hobby Lobby. Mr. Thumperton is a gift from a friend several years ago. The boxwood wreath I believe I purchased from Target a few years back. I could not resist the green buffalo check rugs from Target. The bunny planter is from HomeGoods years ago. 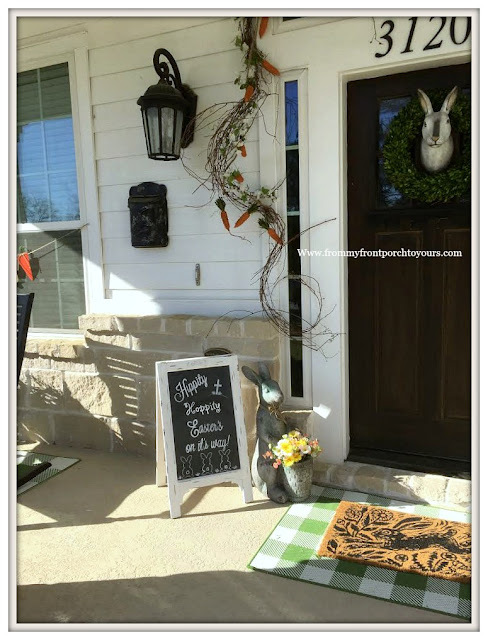 Bunny door mat from Target. 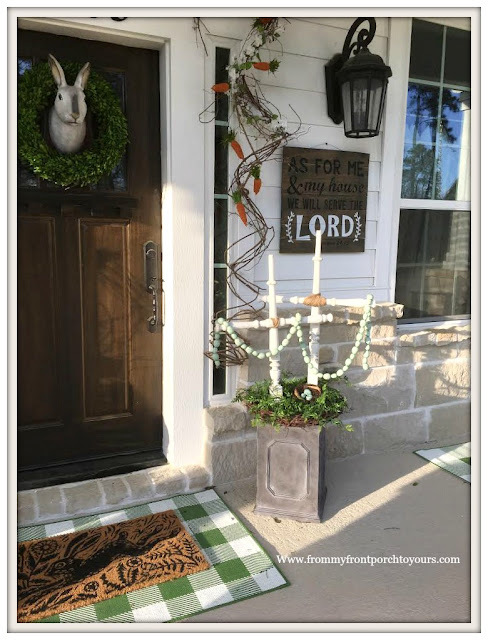 I love the DIY crosses I made. I used some old vintage table legs and vintage spindles I had in my stash. Large nest a gift from a friend a few years back. 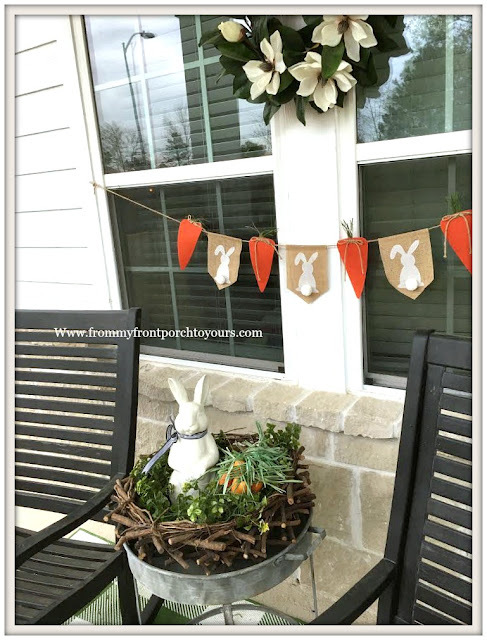 Bunny is from Hobby Lobby over 10 years ago. He has seen a lot and his ears have been glued back on on several occasions. 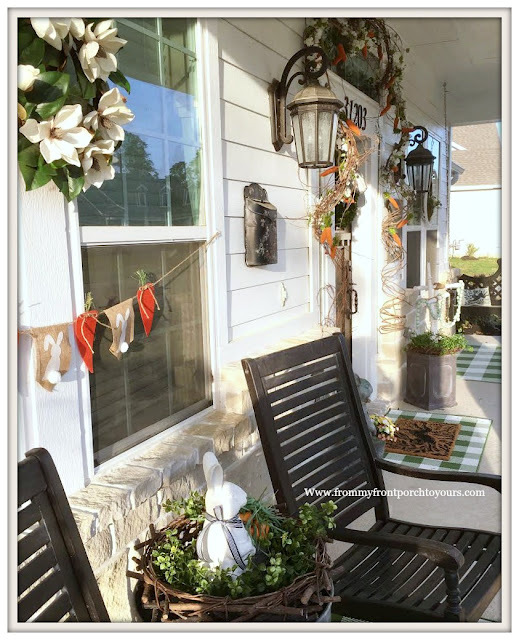 I moved our rocking chairs back to the front porch. They are from Grandin Road. The perfect staple for this time of year. It was hard taking pics of the porch right now because of all the pollen. It seemed as soon as I would wipe it off it would be right back so I just gave up. I didn't even put out any pillows because of the pollen. Thanks for stopping by for a visit! I hope y'all are having a great week. Your porch is so inviting. I love it all. The rugs absolutely set everything off... and I love the door decor.. that bunny is fabulous! I love how everything is so seasonally perfect but not frufru! You certainly have a knack for the creative!!! Thank you so very much for stopping by and your sweet words! I love the rugs as well. It can get expensive because I like to change them out so I always have to watch for sales. Hope you ave a great week! 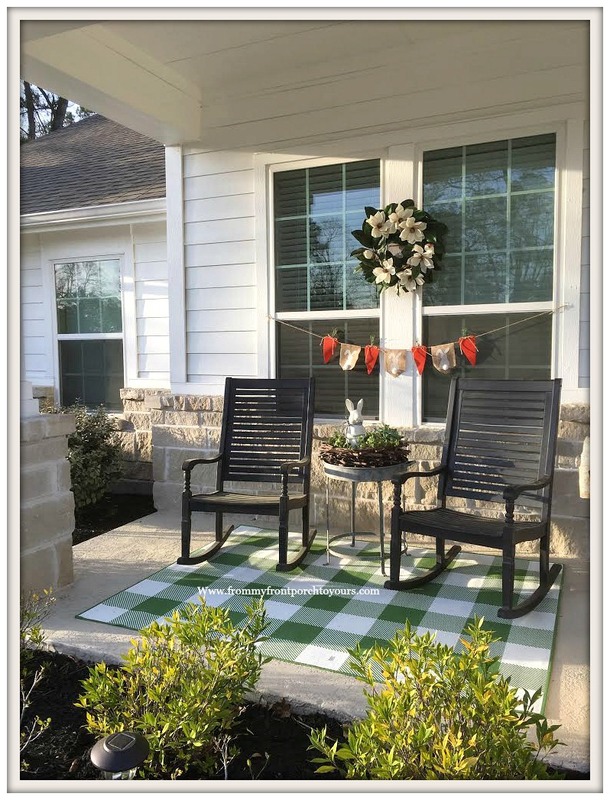 Your spring front porch looks great! Our pollen season has not begun yet, but it will soon! Thanks Penny! Our pollen season is officially over thank the Lord! It was worse than last year. I think because of all the rain we have had with Harvey and then the snow. Beautiful! 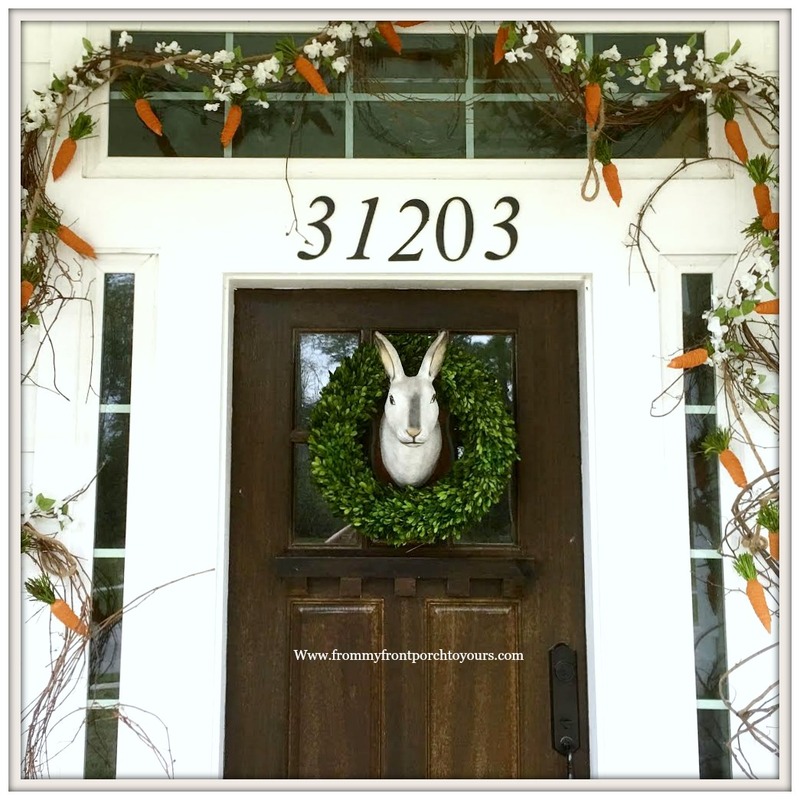 Love that carrot garland!!!! Thanks Julie for visiting! Hope you have a great week. It all looks so welcoming and perfectly springy! I love your crosses especially, and I just might have to have the green buffalo check rug too! 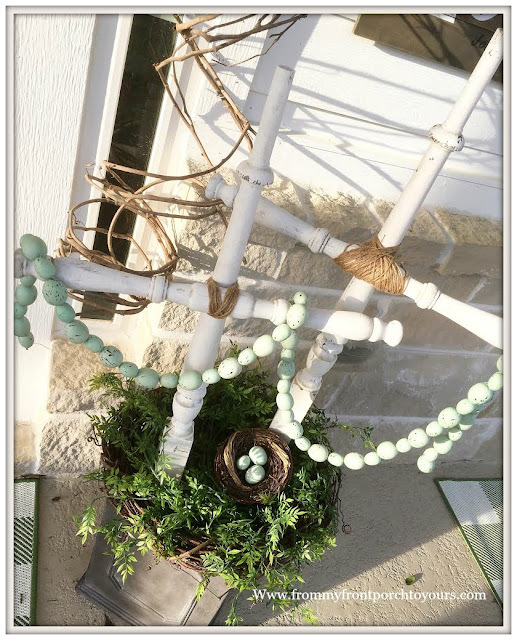 I hope you will link up this post on Friday at the Spring and Easter Joys Link Party on my blog. I am featuring you on my Facebook this evening if you would like to drop by! Happy Easter! Thanks Amber. I will have to head on over and link up. Hope you and yours have a blessed Easter! LOVE Mr. Thumperton and company! 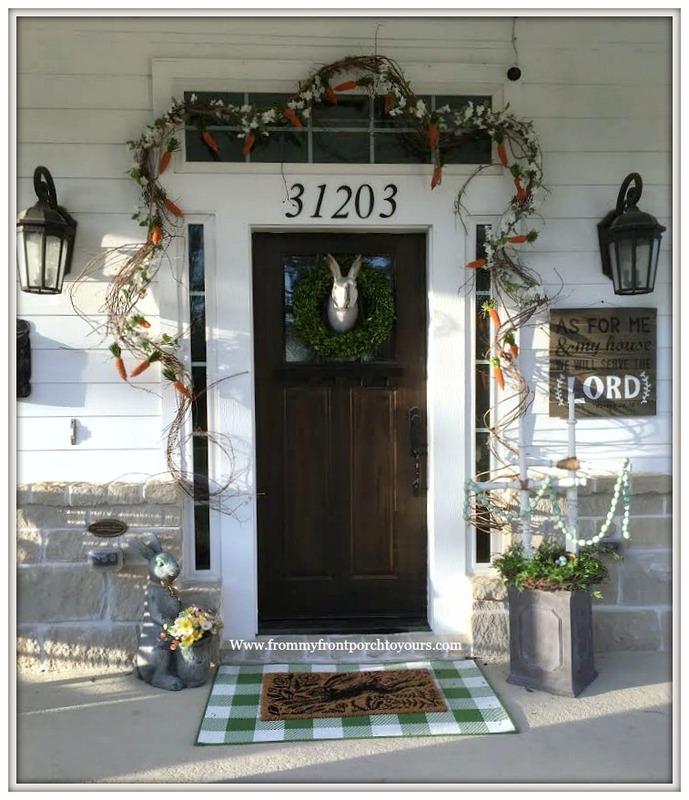 that door twig garland with the carrots is precious! Thanks Debra! Hope you are doing well my friend. Love, love your beautiful Early Spring Porch Pamela! !....I too love your DIY crosses...Our pollen has not arrived yet...we have had lots of rain so I am hoping it will keep it to a minimum...but not likely! :( Happy Spring Pamela! Happy Spring Shirley! Hate we could not meet up when you were out but I truly know how that goes! It is tough trying to get everything in. Love you Spring porch, Pam!! Thanks so much for stopping by !! Happy Easter!! Christine thanks so much sweet lady!